Danny Boyle is good at taking a grimy subject, flashing it a smile and stabbing it through the heart with a big, fat, dripping shot of adrenalin. For ‘Trainspotting’, he countered the lethargy of heroin with energetic chases through the streets of Edinburgh and the beats of Underworld on the soundtrack. For ‘Slumdog Millionaire’, he batted away all sorts of deprivation in favour of a final-scene Bollywood dance number in a Mumbai train station. When he’s not having fun with genres (‘28 Days Later’, ‘Sunshine’), he has a knack for telling tales from the real world – but doing so from countless strange angles and with endless hurried flights of fancy and imagination. Nothing and no one stays still for long in a Boyle film. There’s little more gruesome and extreme than the story of Aron Ralston, an American outdoors nut who in 2003 went canyoning alone in Utah without telling anyone where he was going. James Franco plays the frenetic 27 year old as an experience junkie and sociable loner. He bombs through the desert on a mountain bike leaving a trail of dust behind him. He meets girls in the wilderness, makes them laugh and leaps into underground lakes with them before saying goodbye. He bounds over gulleys. Then he misses his footing, slips into a canyon and a boulder follows him down, pinning his arm to the wall just as he lands on his feet. He’s trapped, and the film’s kineticism turns in on itself: like Ralston, its energy is stuck in a hole. From the off, Boyle winds up our nerves with split-screens, pumping music and archive inserts – and he never stops. We know, of course, that Ralston eventually escapes by carving off his arm with a penknife, so there’s a deep intake of breath when the accident happens early. Where will Boyle take us? It’s a great challenge to witness and it brings out the best in Boyle. Just don’t expect to breathe normally for some time. Boyle focuses intensely on Ralston’s thoughts, both rational and delusional as the days pass. He tries pulleys. He tries scratching away at rock. He tries everything. Franco’s performance is a brilliant show of constrained muscularity. We see flashbacks of his relationships and realise that he has some ways to mend if he ever gets out alive. We’re stuck with Ralston, and we’re privy to his mind because he keeps record with a camcorder in his rucksuck. On top of that, Boyle uses every angle available to him, and AR Rahman’s score helps to capture and stress Ralston’s mental fragility. The scene which all viewers will expect and dread in equal measure – the cutting of the arm – is horrific and smartly done. Boyle doesn’t sidestep the truth: we see Ralston picking through nerves as Rahman’s music records the most nightmarish of internal body screeches. But neither does Boyle draw it out unnecessarily. We share Ralston’s shock and wonder as he looks back at his bloody severed arm stuck behind the rock and, like him, wonder how it ever came to this. 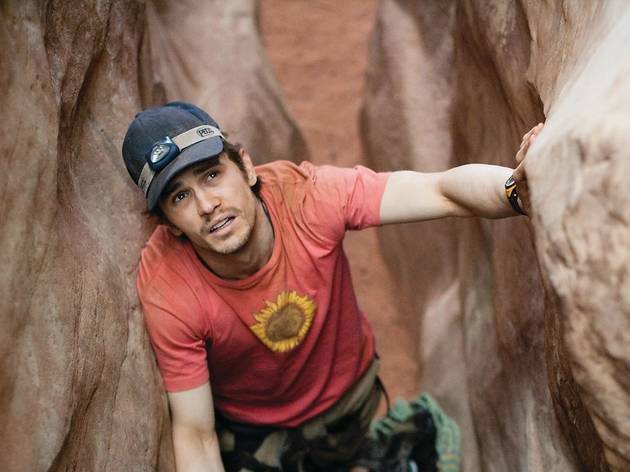 ‘127 Hours’ is a tough ride: not only because of the grim facts but because of the overwhelming experience of total cinema that Boyle inflicts on us to tell Ralston’s story. At the end, we stagger like Ralston from the dark into the light. We might have both our arms left, but our nerves are just as terrorised. this is a fantastic review im looking forward to watching the film. This movie is horroble, the acting is so boring and you know from the start he will cut off his arm, the actor is emotionless most of time and only does "i need water faces", we have no idea about the main character untill half into the movie. Its a waste of time to watch this movie because you wont be entertained by it, the drama is shown well the inner fight i like the idea but its just so badly shown, the scener is great keeps you in the mode that makes you feel tight and you have little space, but great sceney wont save the entire movie. One word 'Excellent'. How this film goes through his emotions and thoughts as he stands helplessly. This film, although a little disturbing to some, is very well made! Nice to see the real victim at the end too! Rich kid arrogantly fails to leave a route plan before heading out into the wilderness, has an accident and feels sorry for himself. Some heavy elaborate political point about individualism is attempted. Glad the film wasn't longer. Nice photography. Like one of the other viewers comment the music was very fitting to the film.The story line was limited but they drew the plot out very well.Time lines were fine and kept you wondering what the outcome would right to the end. Having read the book when it came out a few years ago and really enjoyed it, I was amazed when I heard it was going to be made into a film - just thuoght this can't work! How wrong was I? It was superb and I'd watch it again. The music is the best part of it and makes a good film even better. Thanks Danny Boyle, keep them coming! In response to PEEJ's comment: 'Absolutely terrible... nothing really happened. He met girls, fell down a canyon and got stuck.' That's like saying Shawshank Redemption was about some guys who sit about in prison and do nothing. Clearly you missed character development - not to mention the 'true story' aspect that gives the whole story some weight. What did you think would happen in a film about a man that 'got stuck' and had to cut his arm off? IMO, Danny Boyle made a good film. He directed with his trademark visual flair and came up with some inventive ways of keeping the film flowing and dynamic. Also, Franco gives one of his best career performances in what must have been quite a difficult role to pull off (having to keep the audience's attention whilst sitting in one place for most of the film). Absolutely terrible. To say the film was pretty long, nothing really happened. He met girls, fell down a canyon and got stuck. Drunk his urine, recorded himself, and cut his arm off. It showed no background hardly, to Aron, neither did it show any reaction to his family when he had returned. Would not recommend. Great film to start the year with. Like all of danny boyles movies & think he was the correct director for this choice of film,i.e: to fill in a few 'gaps' in the script(cos there aint much to talk about when your trapped) True story too & believable. I guess most people seeing this film would have read a review first, so pretty much know the storyline - it's fairly simple. Even so, there are a few surprises along the way. This is extremely well shot, and superbly edited. 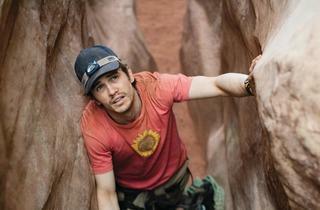 Bearing in mind Aron Ralstonâ€™s talking to himself, or muttering, or keeping a video diary on his hand-held throughout the film, the scriptâ€™s good, and sometimes amusing. I was surprised how good this movie was. Three stars / perhaps four stars if I was being generous. Rolling stone - from pumping split screen opening credits to the slice and dice finish. Rock on! A fantastic real life story with all the emotion and more of â€œTouching The Voidâ€� The editing and music were superb as were the close ups of the lead actor as he struggled for life like a snared animal. Flashy but interesting account of a true life story. My grirlfriend was holding on to my hand for emotional support unaware that I was having to control my breathing to hold back pending faintness. The guy in the seat next to me was choking back tears and I could sense that every other cinema goer had been through some form of emotional rigour. I don't care how tough you think you are this is intense. Perhaps the plot doesn't sound expansive but it's imaginatively directed and stands out as another Danny Boyle success. A great film! Go see it! Definitely not a film for the faint-hearted but totally worth the anxiety and heart palpitations. LOVED it! While watching the movie at the edge of my chair I was sweating just because of the intensness. A must see!